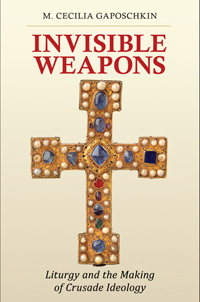 When, last summer, Professor Andrew Holt asked me to list the top ten most influential monographs on the crusading movement, I headed that list with Invisible Weapons, although I had not yet read the final iteration. 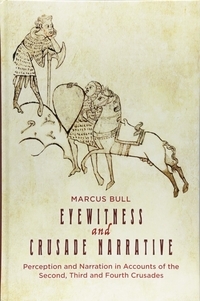 I had seen the work in multiple drafts, and knew that it was addressing, in important ways, new directions in the field of crusade historiography: the study of the impact of crusading on European identity and culture and the creation of historical and spiritual memory and eschatological purpose through not only written narrative but oral traditions, ritual gestures, liturgies, sermons, material objects, and relics. 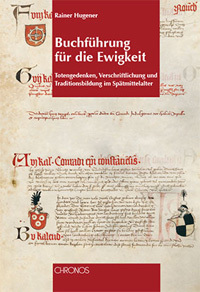 The final printed product demonstrates Gaposchkin's ability to build on her own formidable research and place events within a larger contextual framework and her considerable generosity and humility in subjecting her work to rigorous review by experts in the multiple fields melded in her monograph. It is also a testament to the way in which the field of crusading history can shift; topics which were considered peripheral when I was a graduate student in the 1990s have now become central foci: sermons, biblical commentary, liturgy, relics, religious devotion. Gaposchkin poses a seemingly simple yet devilishly difficult to answer question regarding the devotional and ideological side of crusading: how can one integrate the evidence of liturgy and prayers surviving in liturgical books with the narrative sources for various crusades to shed light on the evolving culture of holy war in the Middle Ages? How was the liturgy used not only to contextualize and commemorate the success of the First Crusade in the West and in the Levant, but also to place continuously evolving "crusading ideals at the heart of Christian identity" and embed "crusading warfare squarely into the eschatological economy" (4)? As her magnificent historiographical and methodological tour of medieval liturgy notes, liturgy not only constructed sacred memory and history, but linked the temporally specific and historical to the transcendently and militantly (both in spiritual and worldly terms) eschatological. Liturgy also yoked individual to communal salvation, the spiritual and temporal health of the crusader or devout penitent to the fate of Christendom itself. It was only this juncture which enabled the formation of a "crusading society" in the West and its eternal refashioning to meet threats as diverse as heretics, political opponents, pagans, Saracens, Turks, and Ottomans. Its legacy was the inspiring and yet pernicious insertion of holy war into an emerging Western identity, as recently demonstrated in western reactions to the events of 9/11 and the activities of ISIS. Gaposchkin convincingly demonstrates how the rituals of the liturgy became essential to the evolution of the concepts underlying the First Crusade and for shaping the cultural interpretation of that campaign, a function which continued with each new crusade. In turn, crusading refashioned the liturgy itself; sacral warfare became part of the liturgical year. Liturgy had not only an ideological impact, but pragmatic functions including defining specific goals against the enemies of Christ and legitimizing specific campaigns and the crusading movement in general. Liturgy could also broaden the base of support for the crusade by enabling the involvement of non-combatants in the crusading enterprise through participation in the prayers, processions, supplications, fasting, and almsgiving allied with crusading campaigns; crusading warfare became equated with spiritual warfare against vice and the Devil. The "institutionalization and routinization of crusading in the thirteenth" and following centuries therefore did not devalue the spiritual nature of the enterprise, but rather integrated it into the ritual and devotional life of Christendom (10). Invisible Weapons covers an impressive temporal and geographical range. Gaposchkin's first chapter traces the foundational building blocks upon which Urban II's appeal in 1095 and the favorable response to it rested: the image of Jerusalem, rites of penitential pilgrimage, the concept of sacralized warfare and the symbolism of the cross. Modulating and building on the ideas seeded throughout Erdmann and Alphandéry-Dupront, Gaposchkin argues that the First Crusade evolved from and then recombined with existing, largely monastic, devotional and ideological paradigms. This allowed for the smooth integration of the campaign into a larger eschatological schema in which fighting Muslims was part of combatting the devil. Her second chapter deftly plots the ways in which liturgists forged new rituals to symbolize the status of crusaders as temporary religious and armed pilgrims through modifying existing rites for the blessing of the paraphernalia of war and pilgrims' staves and scrips. What about liturgy in the field, one asks? 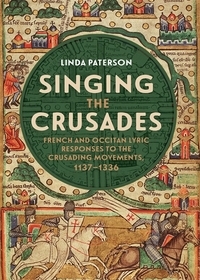 Chapter three traces the ways in which the first and later crusaders adapted existing liturgies employed in western warfare and the liturgical year to enact and confirm their identity as the new chosen people petitioning for divine favor and to reinforce the concept of the crusade as a penitential enterprise, a "monastery on the move" (to use the words of the late Jonathan Riley-Smith). A new feastday (July 15th) and the associated liturgy helped to commemorate the Christian occupation of Jerusalem in 1099 in the new Latin Kingdom of Jerusalem, while the local impact and commemoration of the First Crusade is attested by surviving liturgical observances scattered throughout western Christendom which echo the "bellicose triumphalism" of contemporary monastic crusade narratives (13). 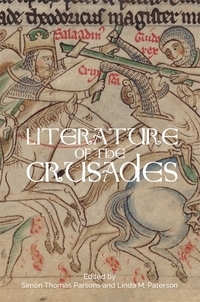 In a fitting coda, the final three chapters outline the ways in which Christendom shifted gears from triumphal to litanic liturgies forged to explicate and remedy the succession of defeats which followed the loss of Jerusalem to Saladin in 1187, continuing in the form of the threats posed by the Mamluk, Mongol, and Ottoman empires. Even as territorial gains in the Levant faltered, popes and local churches called for institutionalized and coordinated "programs of liturgical intercession," viewed as spiritual warfare and an expansion of crusade participation to the entirety of a Christendom whose sins were viewed as the direct cause of military setbacks. Religious and social reform and crusading were allied as never before and the crusade became a daily part of Christian life. The association of crusade with Christendom would linger well into the fifteenth century and beyond. Liturgical innovations in modifying prayers against pagans to fit a defensive rather than offensive war against the "Turkish threat" testify to the continued vitality of Latin Christianity (despite material threats on multiple fronts and eschatological fears), even on the eve of the Reformation. 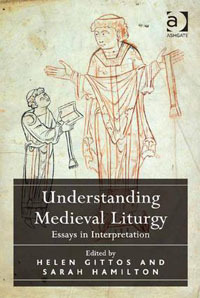 The author's experience as a teacher of undergraduates means that this book is written in an accessible and engaging manner, with useful summaries of liturgical and crusade history (16-28). 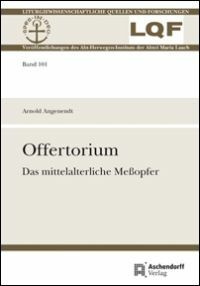 Useful appendices provide new material published from manuscript sources and timelines of the development of the all-important "clamor" and narrative evidence for the performance of liturgy in support of the crusading movement (263-323). As the manuscript list attests (325-26), Invisible Weapons is a monumental work of scholarship which nonetheless, in the best manner possible, raises as many questions as it answers. It will undoubtedly inspire a slew of dissertations, yet it could also be utilized in advanced undergraduate courses or a graduate seminar on the crusades and/or religious studies. It will certainly join the highly selective section of my bookshelf reserved for "first port of call" reference works.